Learn how to make a Port Wine Cheese Ball. 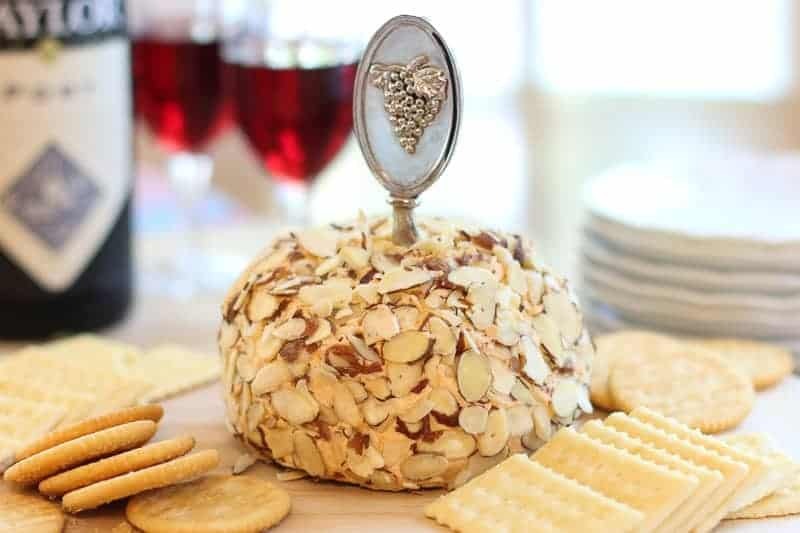 This swanky retro Port Wine Cheese Ball recipe was featured in City View Magazine. It has a sneaky heat balanced with the sweet port wine. Spread the cheese on crackers or apple slices for a fun party appetizer idea. This little Port Wine Cheese Ball was popular in the 70s. It was served at all of the dinner parties as a holiday appetizer. And why not? Wine + Cheese= Perfection. They were on to something back then. My grandmother kept a container of the Wisconsin made version in her fridge that she bought at the store. As a child, I would break into the port wine cheese spread when I came to visit and spread that cheese all over a ritz cracker. You can still find a store version at all your local grocery stores, but…..
the homemade version is so much better!!!!! Especially because this is such an easy cheese ball recipe. 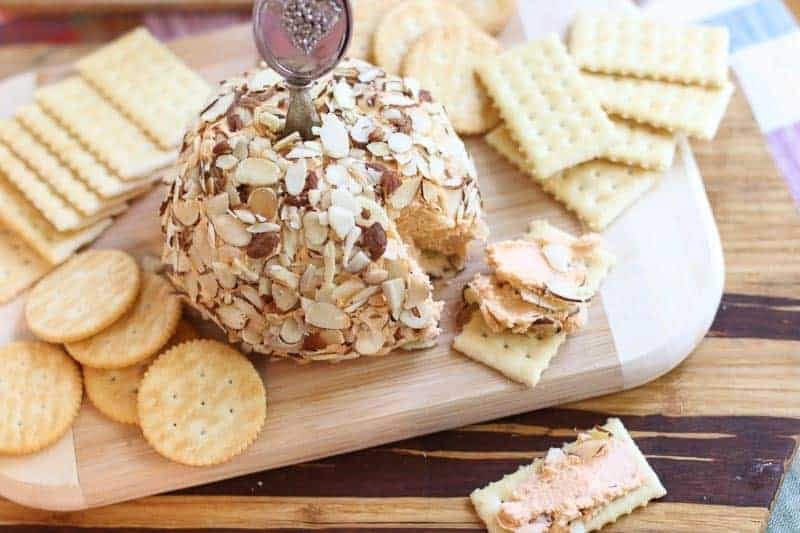 I make this cheese ball with almonds. Some people like to roll it in pecans. That is good also. I also like to mix a bit of cayenne pepper to balance the sweet and salty with a bit of heat. It doesn’t make it hot, it just makes your taste buds POP with each little bite. Port Wine Cheese is a super easy appetizer recipe to make, perfect for the upcoming holidays. You should give it a try. If you like this wine recipe, check out my other recipes featured in the Food & Wine Issue in City View Magazine: Best Crockpot Beer, Brats, & Onions Recipe, and Easy Cheesy Jalapeño Beer Bread Recipe. 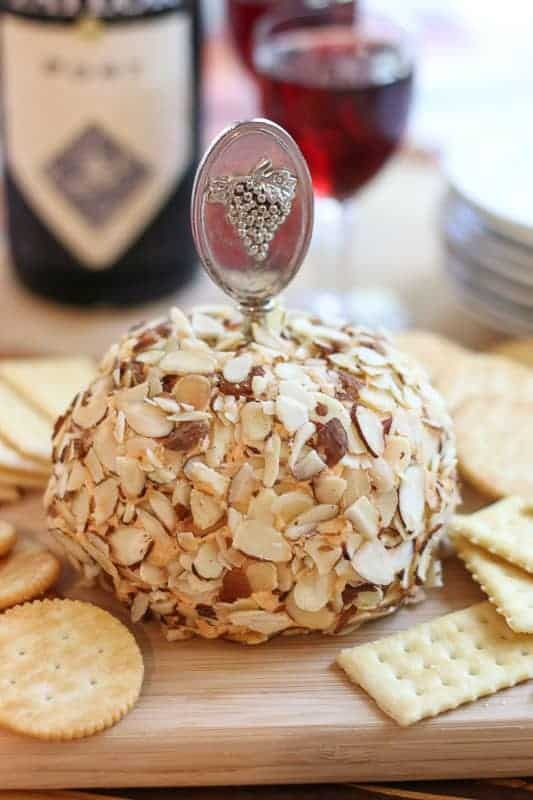 This swanky retro Port Wine Cheese Ball with almonds has a sneaky heat balanced with the sweet port wine. It makes a lovely holiday appetizer but is delicious enough to eat all year. Set oven to 350 degrees. Bake almond slices on baking dish for 5 minutes or until toasted. Set aside. In a food processor, add cheddar, cream cheese, port wine, Worcestershire sauce, cayenne pepper, and seasoned salt. Pulse until completely mixed and smooth. Using a spatula, transfer cheese mixture into a food storage container for 2 or more hours for the cheese to firm. Once firm, cut a piece of parchment paper and empty the mixture in center of parchment paper. Form into a ball. You can use the parchment paper to help you form the ball. Cut an additional piece of parchment paper. Place toasted almond slices on parchment paper. 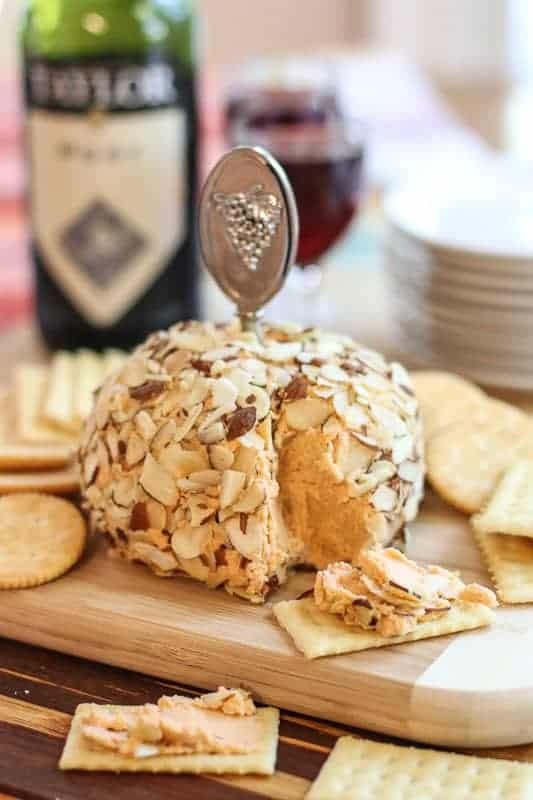 Roll the cheese ball in the toasted almonds until it is completely covered with the toasted almonds. Serve with sliced apples or your favorite crackers. red cabbage for the holidays. Can’t wait to have my 17 year old grandson try this vintage cheeseball. I like this recipe because it’s simple, the portions of the cheeses are equal. I personally LOVE EXTRA SHARP cheddar cheese, and the other recipe I tried used 2 to 1 ratio cheddar cheese to cream cheese, respectfully 16 ounces of cheddar to 8 ounces of cream cheese. That’s going to be salty even with a mild cheddar. It also used butter and that didn’t do a thing for the recipe. My wife thinks salt is a spice, she’s Irish, I get it, so I tailor the foods I make for her leaving out things like cayenne pepper and I drastically reduce Worcestershire sauce to please her palette. I’m confident that she’ll LOVE this cheese ball and I can’t wait for her to try it. This is definitely a recipe you can try if you want to impress your guests. I’ve done something similar last year for Christmas and there were no leftovers! It is on my to-do list for this winter, thank you for sharing!